This is midyear season on college campuses and often a wake-up call for new students and therefore, it’s essential that you get to know the most important people to help you succeed in college. It is easy to forget that college is to teach you to be better than you were when you got there. It is to allow you to grow.So, getting a B or even a C on the first midterm should not come as a total surprise and is certainly not a tragedy. It is a wake-up call. It means that maybe you have to do some things differently than you have in the past. It may mean that there are some new and important people that you should know in college who can help you. First, you should really get to know your professors as among the most important people to help you succeed in college.They want you to ask questions in class. It is a sign of interest and curiosity. Engaging in class discussion may even make up part of your grade.Raising your hand helps the professor get to know you but also you should take advantage of office hours. If you did not do this before the midterm that caught you by surprise, you certainly should after. Be sure to ask what it was that you did not seem to understand. What should you do next time to do better? Share any questions about content that you have not understood. Share how you study. It maybe that you need to apply a different way of reading for a particular field. Sciences need more memorized content, for example, than literature which requires making more visual pictures when reading. The professor can tell you the best way to approach his/her field. 2. Your Advisor is another of the most important people to help you succeed in college. You may have been placed in the wrong section of a course where you are over your head because you did not have the background needed. Even if you test into some areas like languages and math, if your score was at the lower end of the ranking scale, you could benefit from a class that will enhance your understanding. Your advisor can help with this. If you are really in academic trouble your advisor can tell you what your options are. It may be to drop a class, take it pass/fail or literally study and CLEP out of the class. Advisors are well-known to be among the best people to help you succeed in college. 3. The Writing Center or Academic Help Center has some of the most important people to help you succeed in college. If your issue is that you had a low grade on a paper maybe you need some help with your writing skills and so the staff at the writing center will be among the most important people you should get to know at this time of year. We all need to have some help sometimes with framing a paper or grammar or punctuation. The writing center can be sure that you are giving your best. 4. The Librarian is one of the most important people to help you succeed in college. Also if the issue is that the content of your written paper is not adequate to then the librarian can become one of the most important people to help you succeed in college. They can show you how to access many sources and how to be sure to cite them correctly so that you are not accused of plagiarizing. They can lead you to places like academic journals that you may never have thought of on your own but which will certainly impress your professors. 5. Your classmates may be among the most important people to help you succeed in college also. If you have been going to class and then going home or to work without connecting with your classmates you are missing a very important resource. Studies have shown that students who are in study groups do better because they are pooling their knowledge and understanding. It is actually more like the way work is done in the “real world” where problem solving is done in teams or committees. 6. Tutors can also be the most important people to help you succeed in college. Colleges have free tutoring resources and there are more online as well. You can then have the one-on-one guidance you may need to understand concepts covered in class. Sometimes there will be a graduate student assigned to a course who can also help in this way. Grad students in your department can be very important people to know. Remember you are paying for these resources—the faculty, the adviser, the librarian, the writing and tutoring centers, the grad students, the study spaces—out of your tuition dollars. College is about learning and getting better along the way. That includes learning who the important people are who can help you reach your goals. This will be true in school and in the rest of your life. So get to know those important people now. Marcia Y. Cantarella, Ph.D., has held positions at Hunter College, Princeton University, New York University, and Metropolitan College of New York. During her 22 year career as a dean and vice president of student affairs she has enhanced the academic experiences of and outcomes for generations of students. She is an expert on showing you how to help you determine the most important people to help you succeed in college. 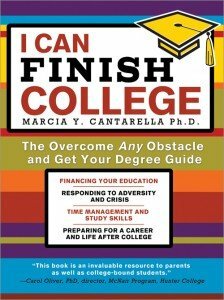 Visit CollegeCountdown.com to learn more about Marcia Cantarella and her new book I Can Finish College.